The promise of Palm Springs realized. Whether you're looking for a family reunion, corporate retreat, or just a fabulous get-away, Palm Springs Luxury Vacation Homes has a perfect home just for you. Why rent a vacation home? There are so many good reasons--you’ll never share a pool, the kitchen is always open and your privacy is ensured--all for a per-person rate that is competitive with group rates at a hotel. Our 5-star concierge service ensures you'll be personally guided through all the amenities and extras so you can spend your time relaxing right from the start. psPalms is a large 6 bedroom, 7 bath luxury estate with pool/spa, mountain views, huge indoor/outdoor living areas and all the modern comforts and conveniences. psMid-Century is a classic mid-century modern home renovated to absolute perfection. 4 kitchens, 6 Bedrooms and 5+ baths with breathtaking mountain views. psTiki is a huge mid-century modern home with 6 bedrooms and 5+ baths including a 35x35 great room, outdoor kitchen and private casita with separate kitchen. You're invited to come to Palm Springs and stay with us. You'll find out why our guests have consistently rated each of our homes 5-stars on VRBO.com and there is a reason for that-- we clearly love what we do and it shows. Before you book one of our homes, we encourage you to read the home’s reviews because our guests’ voices are the best way for us to share what Palm Springs Luxury Vacation Homes is all about--our passion and commitment for making your stay an experience. That's right, we understand a vacation rental is more than a place to sleep; it should be an experience to share with friends, family and colleagues. We have one of the highest repeat rates of any vacation rental company in Palm Springs--in fact more than once our repeat guests have booked homes still under construction--sight unseen--simply based on their prior experience and trust in the level of design, detail and amenities we consistently deliver. You'll loose yourself in the luxury of the most private resort there is--your very own home away from home with more amenities than you might imagine. Our Modernist Designer homes are extremely well maintained, comfortable and very private. You’ll enjoy the large pools & spas, sunny lounging and shaded areas for a shared group experience as well as intimate private patios adjacent to most of our bedrooms. Speaking of amenities, we have outstandingly comfortable beds, 300 count linen sheets and 100% cotton towels, Our larger homes include as many as 4 dishwashers, 4 refrigerators and fully stocked indoor/outdoor kitchens with many extras like ice cream makers, rice cookers and all the serving pieces you’ll need for entertaining. Our guests love to get away, but we understand the need to stay connected. We feature ultra high-speed Internet with property-wide coverage, LED/HD TVs in every bedroom; house accounts for Netflix and Pandora, as well as AppleTV and Chromecast so you can Airplay or Cast your own movies and music to the 70” TVs and 5.1 stereo systems. We also provide conveniently located USB charging ports for all your devices. Our Designer Mid Century and Modern homes are all located near the charming and vibrant Palm Canyon Strip in downtown Palm Springs brimming with restaurants, shopping, golf, spas and casinos. 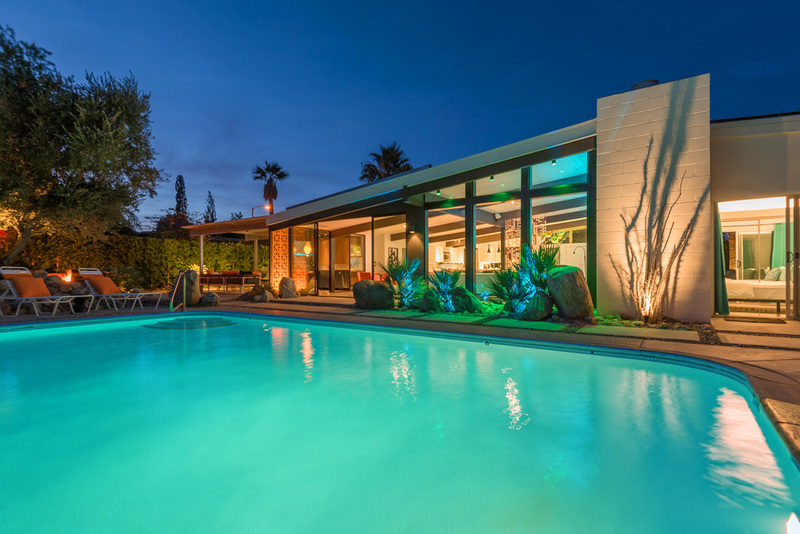 If you're a fan of mid century modernism, look no further as our homes have been featured in design magazines and chosen as signature homes for Palm Springs Modernism Week events and tours. So come join the experience of Palm Springs Luxury Vacation Homes and see why we’re a trusted resource for discerning guests from around the world.